+ EHA installs new historic marker! : The EHA installed a new historical marker at the corner of River Road and US-19/Fairmont Road. The marker tells the story of the Federal No. 3 disaster to passing motorists. + Announcement:The EHA has applied for a West Virginia Humanities Council Grant to build a new traveling exhibit. The exhibit will showcase the history of the Federal No. 3 Mine and the preservation efforts of the EHA. We hope to have the new exhibit ready for the Miner's Day Swap Meet in December. The 2nd annual swap meet will take place at the Knights of Columbus, 1529 Mary Lou Retton Drive, Fairmont, WV 26554 on December 6th 2014. The West Virginia Everettville Historical Association (WVEHA) is dedicated to preserving our past. 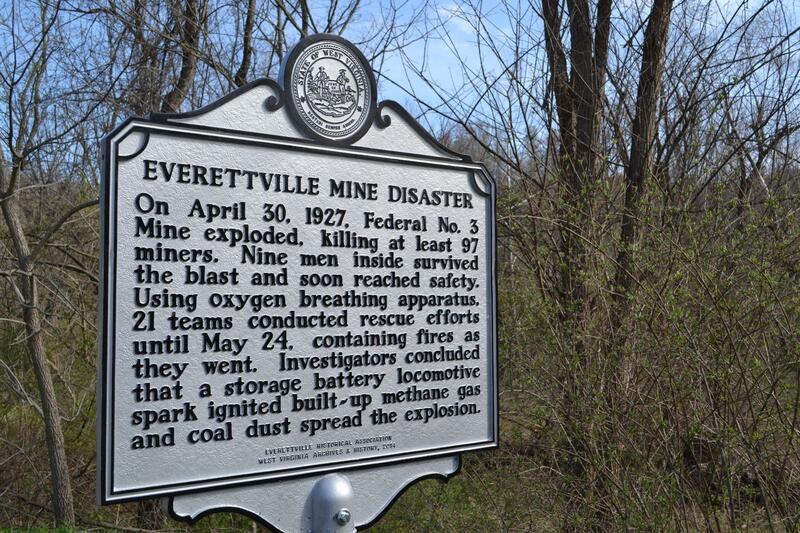 We preserve the past of the Everettville, West Virginia area through the research of Family Histories (Genealogy), cemetery readings, replacement of Veterans Markers, and by restoring the lost history from the coal camps, stone quarries, and the hard working farmer. Our projects center on education and preservation of history. The WVEHA is in the process of funding a Miners Memorial and park to pay tribute to the 149 men who died in the Federal No.3 Mine. A memorial service is held annually for these men in Everettville, Monongalia County, West Virginia. This will pave the way for other miners memorials to be placed in the park. Consolidation Coal Company donated approximately 25 acres at the pit-mouth for this purpose. Please take a few moments to browse the website to learn more about the park and other projects the WVEHA are involved in. You can learn more about the history of the Federal No. 3 mine and the impact of the mine on the surrounding community at the Miner's Memorial Park history website.